To begin with, level II fieldwork is an overwhelming experience. You are in a new and unfamiliar setting, you typically meet your supervisor the day you begin, and you may have no idea the expectations they have for you. For the first four weeks, you are a nervous wreck every time you walk through those doors. But it gets better. You learn. You listen. You observe. You become friends with your supervisor (hopefully!) and look forward to work every morning. All of my OTS friends: if you are reading this, keep chuggin'! This is such an amazing experience for you to undertake. 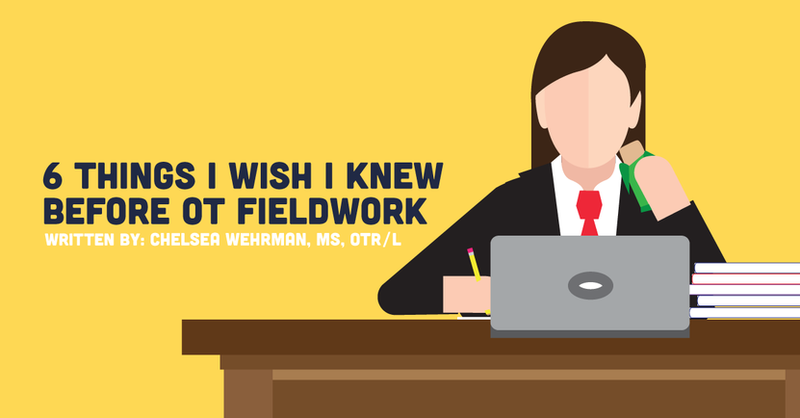 As with any new process, there are always things you wish you’d known when you look back on your OT fieldwork. Here is a list of six things I wished I knew before fieldwork, both clinically and personally. But, we learned that in school . . . it's easy? Being sound in goniometry and manual muscle testing (MMT) will benefit you in almost every setting and is a good basic skill to have when you arrive at your fieldwork. You may have to make adjustments or learn different techniques, but having a solid foundation will serve you well. Make sure to pack easy foods, such as a sandwich, prepared fruit, or granola bars that are easy to snack on while drowning in the world of documentation. Packing lunches not only keeps you fueled and energized for the rest of the day, but also saves you money (and let’s be honest, the healthy lunch you packed will save you from drooling over all of the unhealthy foods in the cafe!). Still curious as to how real adults actually survive in this world...and then you add kids into the mix? Ha! My favorite during fieldwork was my friends texting me: Drinks? After work? Me: I am thinking I would rather meet on Saturday at 5 p.m., like, before my 9 p.m. bedtime. Are you looking for ways to be mindful during fieldwork? Check out Nakisha Gutierrez’s article, 5 Strategies for Self-Care During Mental Health Fieldwork, where she highlights different strategies for students to use to maintain their own mental health and limit stress throughout fieldwork. All documentation systems are different! My school taught us the COAST format; however, both of my sites used different protocols for goal writing. My first site wrote completely custom goals, with all of your own wording, assistance levels, and time. In contrast, my second placement had a "drop box" system, where all of the goals were already written out and you just had to choose what worked best. Although it’s extra work, I personally like writing my own custom goals better. I was able to individualize my clients' plans and use the special considerations I chose. So you arrive at your site and your supervisor starts telling you about this new eval. They say, "PM&R note says R MCA. Presents with hemiplegia, homonymous hemianopsia, aphasia, and right-left discrimination deficit.” Uhhh . . . English, please? Medical jargon is basically another language. During classes at my school, my professors did not speak in medical jargon most of the time, which made it difficult when making the transition to fieldwork. My supervisor was very understanding and broke things down for me, but not everyone gets that lucky! OT Fieldwork Tip 6: Last but not least, ENJOY IT! School helps you form a foundation to prepare you for fieldwork. But fieldwork is what makes you fall in love with this amazing profession even more than you possibly thought you did before! So yes friends, there truly is no other career better than OT. (That may be a biased statement.) Now study up on your MMT, ROM, and medical jargon, and enjoy your fieldwork!